This versatile Compact AC/DC Charger from Watson charges any NB-10L lithium-ion battery via the included, dedicated battery plate. The charger runs on 100-240 VAC power, allowing for worldwide use. It features a fold-out, 2-prong US plug and is supplied with a European plug adapter, as well as a 12 VDC car charger that plugs into a cigarette lighter. This makes it ideal for use both at home and on the road. 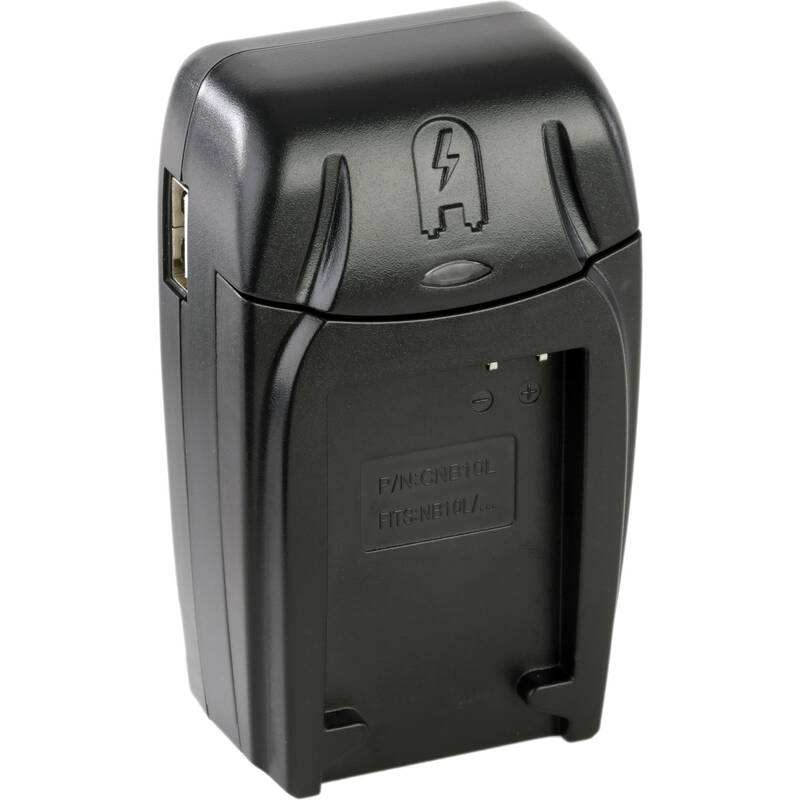 Compatible with any Canon NB-10L type battery. Box Dimensions (LxWxH) 7.1 x 4.6 x 1.2"
Compact AC/DC Charger for NB-10L Battery is rated 4.9 out of 5 by 15. Rated 5 out of 5 by Don A from This is a great value! I have a the charger Canon makes but wanted a backup. Not only is the Pearstone charger about half the price of Canon's,it also comes with a 12-volt DC attachment so I can charge batteries in my car and with a plug adapter that is the one most commonly needed one in Europe - Canon's charger does not have these. Rated 5 out of 5 by Talon from Gotta have for on-the-go. I'm a traveler and outdoor photographer often nowhere near electric outlets and definately not 120ac most of the time. I bought this because of it's 12V recharge capabilities as I use solar panels when in the wilderness to recharge my cameras and other equipment. This model does the job; it is smaller than the 120vac charger that came with the camera and that is a big plus when packing everything in the wilderness. Rated 4 out of 5 by Optical Junkie from Convenient All Purpose Charger I have not owned this long enough to rate its long-term reliability but for the couple of times I used to charge various camera batteries (using different adapter plates) and cell phone, it worked fine. Therefore this review will focus on the flexible aspect of it. I bought three sets - one each for Canon, Sony and Panasonic - to use with a solar-panel backpack. After receiving and using them I realized I only needed one adapter and three face plates. But since the adapters have multiple inputs (AC and 12V car charge) and multiple outputs (for charging batteries and USB devices), they can be used as phone or battery chargers at home, office or in the car. So I get good utility out of them instead of laying them around. The design also helps reducing travel weight and bulk by carrying one adapter with 3 light and thin face plates. Will update if anything changed in the future. Rated 5 out of 5 by Lper from Good product. No issues Great for the comfort and confidence that you can quickly recharge batteries in an mergency. We do a lot of outdoor phtography and are often on the road between locations. Very useful for reducingt the need to carry additional batteries. Nice and compact. Rated 5 out of 5 by Underwater Welder from My empty batteries are now charged. We use Canon g-15 Cameras. Canon brand name charger is almost 2x the price. so far we have had no issues with the replacements and we were able to purchase 2 for the price of one. It also came with a car charger and 220 euro adapter plug. Rated 5 out of 5 by Ellen R from Replacement Battery Charger is an economical winner!! I lost my camera charger and battery and trying to find a replacement for the Canon charger through a store was pretty pricey. This one did the trick and worked on my current battery from Canon and I purchased a 2nd battery as a backup!! Rated 5 out of 5 by Jean-Marc from Great product Cheap, it works well and fast. The foldable US plug is a nice touch, along with European plug adapter. The USB port allowed me to recharge by portable charger while charging my camera's battery. Very happy to have purchased this item. Will this charger allow me to charge my Canon NB 10L battery in the car (using the DC adapter)? Yes, using the DC adapter will allow you to charge the NB-10L battery in a car. Can I get this charger shipped to Canada. As fast as possible. Overnight? You may calculate your actual shipping options/order totals by adding the items you want to a shopping cart. It will then list the shipping options, descriptions, ETA's and fees to your location. The Watson Compact AC/DC Charger for NB-10L Battery can charge the NB-10L battery that came with the G16, yes.